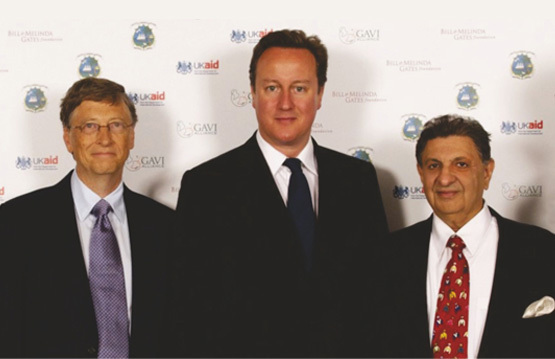 Dr. Cyrus S. Poonawalla (right), Chairman & Managing Director, Serum Institute of India Ltd. with Mr. David Cameron (centre), the British Prime Minister and Mr. Bill Gates (left), co-founder of the Bill & Melinda Gates Foundation, at the GAVI Alliance pledging conference for immunization held in London on 13th June 2011. 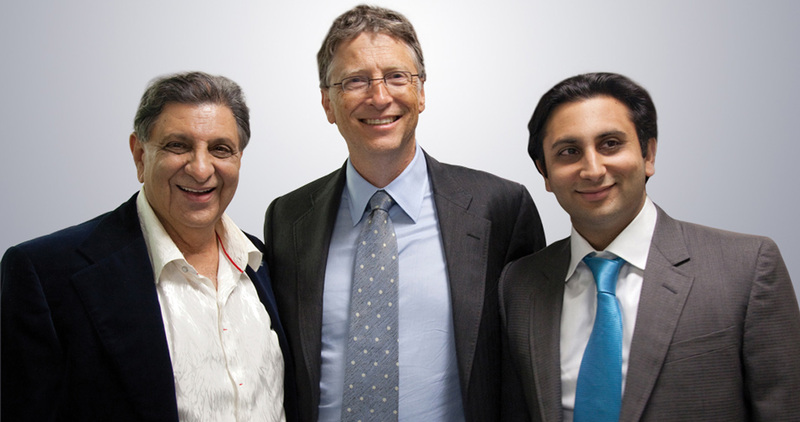 Mr. Bill Gates, one of the world's greatest philanthropist, has acknowledged and hailed Dr. Cyrus S. Poonawalla as one of the few “Vaccine Heroes” at the World Health Assembly 2011, Geneva, Switzerland. At the GAVI pledging conference 2011 held in London, Dr. Poonawalla's contribution in the vaccine field was acknowledged with a memento stating, “Please accept our sincere thanks for your support to GAVI. Through this vital important effort, millions of children will be given the opportunity for a healthy and prosperous life …. Bill and Melinda Gates”. In 2011, millions of doses of vaccines have been donated by Dr. C. S. Poonawalla to the countries of Uzbekistan, Lao Democratic Republic, Nepal, India and at subsidized price to the Philippines and other countries, to support their mass immunization campaigns for children against the diseases of Measles and Rubella. 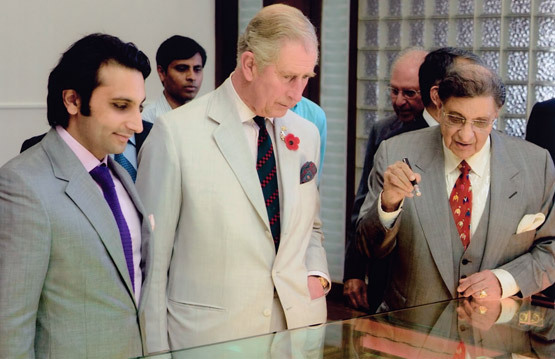 "The satisfaction of saving a human life is immeasurable..."
His Royal Highness Prince of Wales (center) with Dr Cyrus S. Poonawalla(right) and Mr Adar C. Poonawalla (left) during his visit to Serum Institute on Sunday the 10th November 2013. His Royal Highness the Prince of Wales made a private visit to Serum Institute on 10th November 2013 as he was keen to know more about the manufacture of inexpensive yet high quality vaccines that save the lives of millions of children across the globe. He was also interested to know about the work going on in the healthcare sector and the timeline it takes to manufacture a vaccine. His interactions with the scientists of Serum Institute revealed his keen interest in the newer pneumocococcal vaccine being developed at the Institute and also the MMR vaccine. His Royal Highness was impressed with the manufacturing facility and lauded the efforts of the scientists at Serum Institute in making vaccines affordable for the underprivileged children of the world. Dr. Jon Andrus, Deputy Director - PAHO. "Serum Institute of India Ltd. has demonstrated unparalleled focus in supplying several hundred million doses of its Measles and Rubella Vaccines to curb the scourge of Rubella and Measles to 38 regions in America, for the past 16 years, for routine immunization as well as for mass campaigns. The contribution of Serum Institute has been recognized in a true sense, since the region of Americas have showed no recorded cases of endemic Rubella since February 2010." 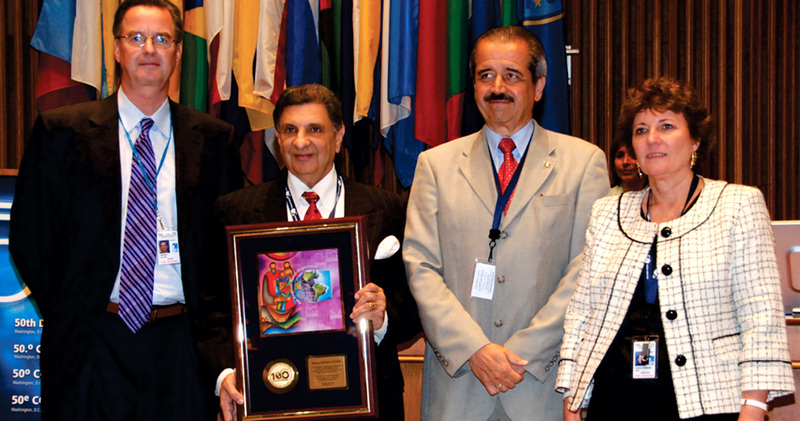 The Pan American Health Organization (PAHO) and the Pan American Health and Education Foundation (PAHEF) presented Dr. Cyrus S. Poonawalla, Chairman and Managing Director of Serum Institute of India Ltd. with the award for 'Excellence in Inter-American Public Health', making him the first Indian to get this prestigious award at the hands of Dr. Mirta Roses Periago, Director of the Pan American Health Organization (PAHO), for his extraordinary contribution to eliminate Rubella and Congenital Rubella Syndrome in America, on 28th September 2010, Washington D.C., USA. 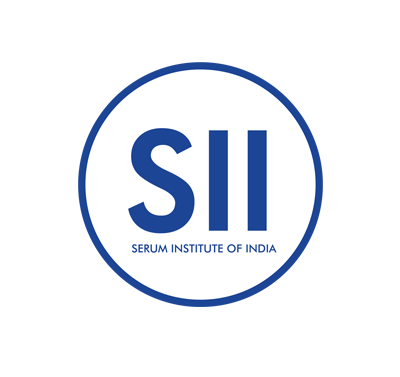 Serum Institute of India Ltd. at Pune on 31st May 2012. "Serum's work has dramatically lowered the cost of these vaccines (and a great many others) and is a true contribution by India to the well-being of the world."